Hamsters love to eat and they instinctively hoard food, so if you aren't careful with your feeding regimen you could be feeding an obsession, literally. Fortunately, hamsters are relatively easy to establish a diet for -- they eat the same relatively small portion of food every day, and if you're consistent hoarding habits won't get in the way of healthy portion control. Limit the amount of unhealthy treats your hamster eats and he'll stay in good shape. Hamsters generally subsist on a diet of processed hamster food you can get from any pet store or well-stocked general retailer. Hamster food typically consists of a mix of seeds and pellets, some hamsters can't be trusted to regulate their own diets and will eat only the unhealthy portions of their food mix -- namely, the fatty seeds. 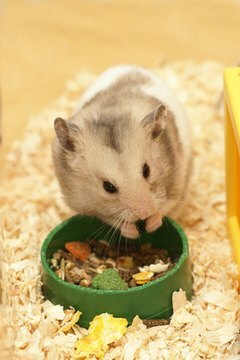 If your hamster seems to regularly eschew everything but the seeds, you may have to restrict his everyday diet to more healthily formulated pellets. These are designed to give him the nutrients he needs, not just the flavors he loves. The size of your teeth is predetermined. Even when they pop out of your gums, they're already fully formed. A hamster's teeth, on the other hand, are more like hair -- they grow constantly. It's important, then, that your hamster eats hard treats that take a while to chew through, or else his teeth can grow uncomfortably long. This can be something as simple as a tree branch, a small dog biscuit or a hard hamster treat. Just one treat like this once a week is typically enough. Hamsters need to eat on a regular schedule every day. This is because they have high metabolism and an instinctive desire to hoard food in the cage. If your little guy isn't getting his regular meals, his digestive equilibrium will be thrown off. Feeding him on a regular schedule means giving him the same portion of food at the same time every day -- not just filling up his bowl when it's empty. While he should have constant access to fresh water, you have to monitor and regulate his his daily food consumption carefully throughout his life, adjusting as necessary. Of course, hamsters don't live off just pellets and seeds. Every now and then, you can give your little guy some fresh food as a treat. Vegetables like spinach, carrots, broccoli and cauliflower are a perfect healthy snack. While fruits aren't fatally unhealthy, their high sugar content makes them difficult for your hamster to digest. Wash any fresh vegetables before giving them to your pet.